Anticipation has been building for a long time regarding the Rail Park, a three-mile linear park and recreational pathway connecting 10 distinct Philadelphia neighborhoods to Fairmount Park and Center City along the site of two abandoned historic Reading Railroad lines. 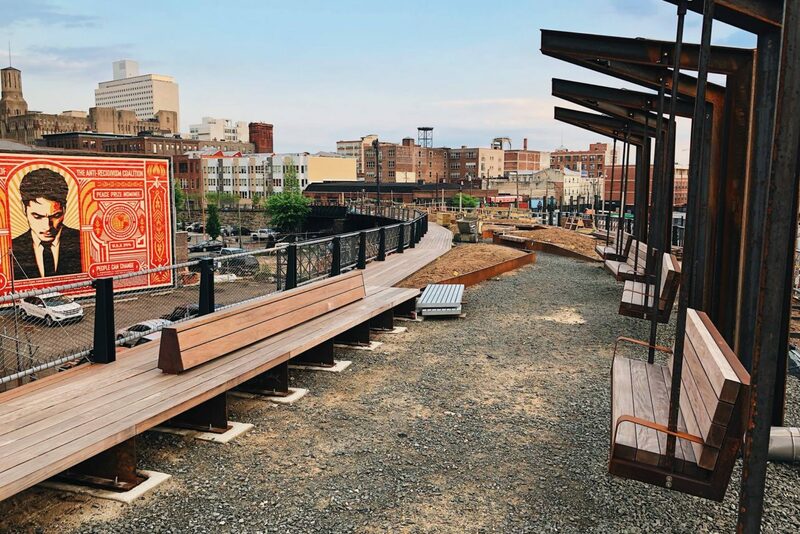 Opening on June 14, will be Phase I of the park, which is transforming a quarter-mile section of the former Reading Railroad—which reaches from Broad and Noble streets up onto the elevated Viaduct and ending above the 1100 block of Callowhill Street in Philadelphia. The Rail Park is part of the High Line Network—a group of 19 infrastructure reuse projects that are redefining the next generation of public spaces across the country. Kevin Dow was recently appointed as the Rail Park’s first Executive Director. Supported by the Friends of the Rail Park Board, Dow will spearhead fundraising, community engagement, oversee park programming and stewardship, and work toward the completion of the organization’s full three-mile vision for the Rail Park. Dow’s diverse background includes leadership positions in the private, nonprofit, and public sectors. 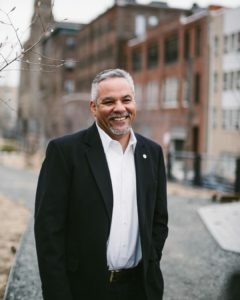 Prior to joining Friends of the Rail Park, he served as Senior Vice President of Impact and Innovation at United Way of Greater Philadelphia and Southern New Jersey; and was appointed by Mayor Michael A. Nutter to a dual role as the Senior Deputy Director and Chief Operating Officer of the Commerce Department for the City of Philadelphia. We spoke with Dow to learn more about the goals and challenges surround this project. You were just hired as the Rail Park’s first Executive Director. What drew you to this role? The opportunity to join a grassroots, community effort to create a special place for residents and visitors to enjoy for generations. The role also represents the convergence of my professional career with my personal passions – bringing together my experience in philanthropy, economic development and social services and matching it with my passion for the natural and built environment, health and community development. Why is this park unique among urban rail parks around the world? Philadelphia’s Rail Park is three miles long, stretching through 10 distinct Philadelphia neighborhoods that will become a green oasis and multi modal transportation linear park. Its uniqueness also lies in its three distinct sections: The Viaduct that is elevated above ground; the Cut that weaves between the streets below ground but open air and the Tunnel the dives underground. What are your goals for the park in 2018 and beyond? We want to activate the park to include programming designed by and for the community members to enjoy. We will use the park to convene residents and neighbors together to discuss its future use and how we may envision development of future phases. Programming will combine educational aspects of the rail’s history, health activities and leisure opportunities. What were the challenges (logistical, financial?) in connecting 10 distinct Philadelphia neighborhoods to Fairmount Park and Center City along the site of two abandoned historic Reading Railroad lines? This is indeed the challenge – and opportunity – we face going forward, how to connect 10 very different neighborhoods. The financial challenges are substantial however not unsurmountable. With time, we can repurpose sections as we raise the resources and take advantage of opportunities as they develop. This is a big part of the job I am looking to succeed at. Also, phase one represents a small section, one quarter of a mile of the entire 3-mile park and will demonstrate what is possible for the remaining parts of the rail line. Engaging the community in “what’s next” will allow us to bring people together who have different backgrounds – social, economic, ethnic – to help break down the social segregation that exists within our city and galvanize residents (and visitors) towards getting the rest of it done! Let’s use the park as a tool and bring folks from the other side of the tracks together to building a more inclusive community. Tell us a bit about the welcoming community greenspace, with pathways, low-maintenance perennial plantings, trees, ample seating, etc. I mentioned using the park as a tool, to help bring diverse communities together that may not otherwise do so. It is important to create a “place”, taking advantage of both the natural and built environment, that will be welcoming and “comforting” to all that come. This means it must be safe, filled with appropriate trees, plantings and ample seating, all of which is conducive to just “chilling” in a relaxed place. Also, we learned a lesson from earlier examples of reuse project and selected materials and plants that will be cheaper to maintain over the long term. What we have selected is sturdy enough to withstand the demands of usage over time. The design preserves and restores much of the existing steel structure. Why was this critical? Preserving the existing structure of the rail line is part of our uniqueness. It presents us with the opportunity to respect and learn from Philadelphia’s industrial past where this city was the represented the largest concentration of manufacturing in the world. It demonstrates our sensitivity to protecting the environment, both built and natural. Phase one is just a small part of what we can achieve. It is the start of a new life for the rail and we want all of Philadelphia, no matter what side of the tracks you live on, what your ethnicity is or station in life to enjoy it, be a part of it and join many others to help us grow it.